Coffee help: Trainee barista Zac Young. Photo: Supplied. COFFEE lovers with an eye for a bargain at Sumner Park will be thrilled to find the local Vinnies store is the first in the St Vincent de Paul Society to have a café. 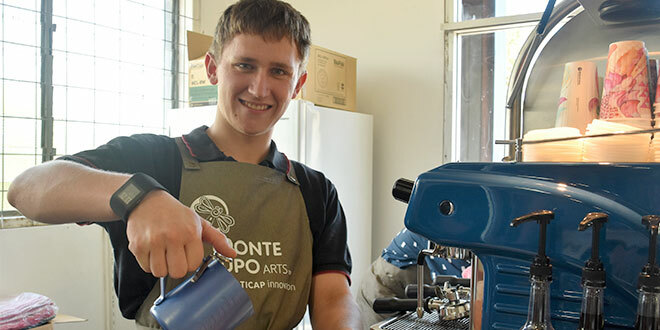 With no cafes in sight at the industrial estate, in Brisbane’s west, Vinnies have found a new range of customers venturing into its store with the introduction of the Monte Lupo coffee cart. Vinnies Queensland and Northern Territory chief executive officer Peter Maher and Multicap Queensland chief executive officer Joanne Jessop opened the Sumner Park coffee project last month. “The opening was a great event – there was a great show of community support, with a really lovely atmosphere,” Mr Maher said. He said the society was always keen to work with other charities and was looking at another long-term arrangement with Multicap hoping the coffee cart at Sumner Park would be the “first of many”. The new carts are part of a joint social enterprise with Multicap, a Queensland disability service who works with and supports people with disabilities, especially those with high and complex needs. The partnership is expected to create opportunities for people interested in training and employment as a barista and to gain employment in a friendly environment at the Sumner Park Vinnies over the next year. The inspiration for the café at Vinnies came when a University of Queensland representative approached the charity to assist in its business school’s competition. The hospitality students researched a business plan for a social enterprise set-up for Sumner Park and the winners would receive vouchers to establish a business in Africa. Vinnies area retail co-ordinator Liz Ward said seeing that Sumner Park had possibilities for a social enterprise, the charity was able to establish the coffee cart based on the groundwork already laid by the students. “It’s very earlier days,” she said, but with the amount of coffee cups used each day at the coffee cart Ms Ward was confident the venture would be success. At no cost to Vinnies, Ms Ward said Multicap was supplying everything, from the coffee to the cups, and the support needed for the café’s two young baristas. One of them, Zac Young, has been diagnosed with autism, and his first taste of work was as a barista at Multicap’s Monte Lupo Gallery Café for three years. “Zac’s very friendly and he remembers everyone’s order, what they have and their names,” Ms Ward said. Both the young men added to the store, Ms Ward said, especially Mr Young’s workmate who is a Dr Who fan. He asked people to look out for Dr Who memorabilia as they shopped around the store. This is the first time that the Sumner Park Vinnies store had a “morning tea rush”, thanks to the proud young men working the coffee cart. “The boys running it are just fantastic and they clearly love what they are doing,” Ms Ward said.